The history of the British Shorthair cat can be traced to the time when Romans had brought over cats to Britain. These Roman cats were cross bred with British wild cats. The offspring of these cats were later cross bred with Persian cats to increase the thickness of the coat. Cats with this lineage are the British Shorthair cats. There are no specific types of British Shorthair cats, but they come in many colours: white, red, blue, black, lilac, cream, chocolate, fawn and cinnamon. 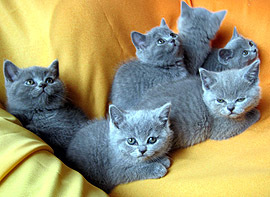 British Shorthair cats can be bred in “self” or “solid”, which are all one colour, as well as the colourpoint, tabby, shaded and bicolour patterns. All colours and patterns also come in the tortoiseshell pattern, which is a combination of red and cream with other colours. The British Shorthair cat is one of the largest breeds of cat around the world, the male being much larger than the female. They are very strong cats and have large, sturdy, muscular bodies. They have broad chest, shoulders and hips. They have a dense, plush coat that is usually described as crisp, given the way it breaks over the body’s contours. They have a round face, with full cheeks and a short and broad nose. Their eyes are large, round and widely set and they can be of many different colors, although copper or gold are most common. They live 14-20 years. 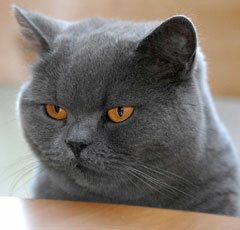 British Shorthair cats are called the “Bulldog” of the cat world. They are very laid back and even if they do get mad, they don’t stay mad for too long. They can be very inquisitive and interested in what is going on, but they prefer to curl up instead most of the time. Being such large cats, the British Shorthairs require a lot of food and nourishment- approximately 70 Kcal per kg of bodyweight per day. However, it must be noted that these cats, especially the ones that are neutered, are prone to become obese. In such cases, they will have to be out on a restricted diet.